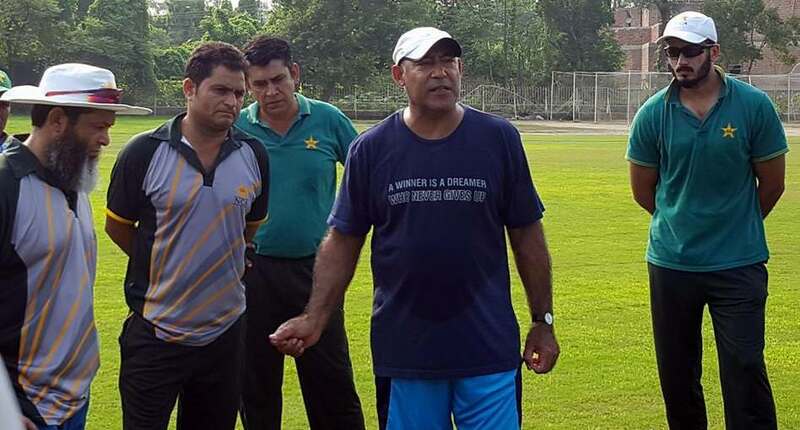 In his third stint at the Pakistan Cricket Board, former Pakistan batsman Mudassar Nazar is currently playing an important role in the development of future cricketers as the Director of Academies at the National Cricket Academy in Lahore. In an exclusive interview with PakPassion.net, Mudassar spoke in detail about his priorities at the PCB, the worrying lack of young good quality batsmen coming through the Under-16 and Under-19 levels in Pakistan, the detrimental effect of Twenty20 cricket on the quality of batting in Pakistan, the deficiencies with the current domestic structure and the steady and encouraging supply of good fast-bowling resources coming through the Under-19 system. PakPassion.net: How is your current role as Director Academies at the PCB going so far? Mudassar Nazar: It’s been fine and something which is similar to what I have done before at the PCB. The slight difference this time is that I have started a new pathway for bringing talent to Pakistan cricket which is focusing on the Under-13 level. In my previous stint with the PCB as Head Coach of NCA in 2001, I had started the Under-16s program and of course we already had the Under-19s well established at that point. So now with me back at the PCB, the Under-13 and Under-16 programs are well established and doing well, nationwide. The success of the Under-16 program can be judged by the fact that we have 9 players in the national squad who were part of this program in 2008 which for me is quite satisfying. What this shows to me is that the various pathways are working and doing their job. To be honest, these programs should have been in better shape had they not been more or less stopped when I left the NCA for my role at the ICC Cricket Academy in Dubai in 2009. To me what the success of these programs does show is that if you stick with your plans and give the boys the resources and the right environment to grow, then they will come through and serve the nation in the future. PakPassion.net: How do you see your priorities in your current role at the PCB? Mudassar Nazar: My first priority has been to kick-start the Under-16 program. This was really the third time this has happened, and it seems that whenever I leave Pakistan, these programs are stopped which to me is a serious concern. Looking back, the first couple of times that I left and came back, it was easy to restart these pathways as I was away for shorter periods of time. However, it was much tougher to get these pathways working back on track after a period of 8 years which happened when I started my third stint at the PCB in 2016. The process to get things moving again took its time and had a toll on our cricket as well, but hopefully we will get there. PakPassion.net: What do you say to those who state that the standard of young batsmen in Pakistan is a concern? Mudassar Nazar: I would say that they are right and that is a big concern for all of us. I have scouted and scoured the country, gone to wherever cricket is played in Pakistan and it's almost impossible to find top-quality batsmen in the country who are coming through the system. We are totally without good batsmen at the Under-19s level and sadly, this issue goes all the way down to the Under-16s level as well. But there is a ray of hope as the Under-15s and Under-13s aren’t too bad and one hopes that in a few years’ time we will be able to produce quality batsmen. But at the moment, there is a huge issue with our batting resources within our First-Class and Under-19 levels and the age groups between. The PCB, to their credit, has been successful in one thing which is that they have arranged two big tours for the A team in the UAE against New Zealand A and England Lions. And suddenly, we have a few good players come to the fore like Abid Ali who got some good runs. I saw him bat and get runs against England Lions’ Mark Wood who can bowl with a lot of pace. He looked very comfortable against that sort of pace so that is great news for Pakistan. We also have some good fast bowlers coming up like Shaheen Shah Afridi and one or two other younger bowlers who are doing well in Pakistan. So, it will take a little time but slowly the talent will come through. PakPassion.net: You mentioned a few names of upcoming players but why aren’t more new names coming through like other nations? Mudassar Nazar: It's very difficult to single out good players like that who are in the Under-19 setup but the unfortunate fact is that they have to struggle a lot at that level. In the past few years, there hasn’t been that much exposure for our younger players at the Under-19 or the A team level in Pakistan. If you compare the setup with say, England, you will see that the England Lions go pretty much everywhere their senior team goes as well. In fact, they go to places where the seniors will tour a year ahead so that they are well in tune with the demands of what the next tour will bring and they have one or two players who come through to the senior team before that tour happens. Whereas in Pakistan in the last 8 or 9 years, the tours have pretty much stopped. The cycle of bringing in new players has therefore stopped or been disrupted and is very difficult to restart. But I feel we are now making progress and these two A tours to the UAE have been very beneficial for our younger players. PakPassion.net: Is it a concern that many of the players being picked for Pakistan A are players who have failed for the national team and lesser number of newer players are getting chances? Mudassar Nazar: I think the A team has a place for both experienced players as well as newer ones. From the NCA’s point of view, we would love to have players from Under-19 or just above in the A squad. But, when you have national selectors who are selecting the A team and the Under-23s, they obviously have an eye on the Pakistan team and are looking to fill the gaps in that team, potentially using A players. But they have an unenviable task because if they don’t select good domestic performers they are criticised and get into trouble as well. This year they have been bringing in a lot of players into the A side who have been performing well in the last few years. Also remember that we are in the middle of the second of two A series this year and so the selectors are trying to blood a lot of players and give them chances to play and see how they perform away from the domestic circuit. I have heard many people say that our domestic cricket isn’t testing enough so this is the selectors chance to blood-in so many different players. The other problem is that ideally, there should always be about 20 players in the A setup out of which 10-12 players, based upon their performances, have a chance to fill in the gaps in the senior team if needed. But that only works if you have had regular academy, Under-19 and A tours over a period of time. If you don’t, then you will end up in a similar situation as us where we have so many different players to try out in a short span of time. Whilst I can understand where the selectors are coming from in this regard, I would have done it differently as my bias is for player development, so I would have preferred youth, but the selectors are looking for the finished article. PakPassion.net: What changes need to be made in domestic cricket to make it more robust? Mudassar Nazar: To start with, we all need to be honest about this issue or we will never find the best solution to this problem. If we were to look at the way our domestic cricket is run at the moment, you will note that there is a lot of politics as far as the regional associations and departments are concerned. We must also understand that it's not the departments that produce players, it’s the regions who do this job, but it is also true that the pick of our talented players go to the departments. We have an odd situation where the departments don’t do any player development of any sort, but they have the financial means to help the players. However, gone are the days when departments used to give permanent jobs to the players in institutions such as PIA or any of the banks. Also, nowadays, the pay structure isn’t that great with the departments and you can see the effects of this by the fact that as soon as a player gets a chance to play a Twenty20 League in any part of the world, he leaves the department straight away. Coming to the state of the associations, the fact is that the office-bearers of these associations are duty-bound to select the players from the clubs who elected them in the first place which is such a mess. What now needs to happen is that all concerned need to sit together around a table and discuss and thrash out the issues at hand, and then come up with a consensus on how best to organise domestic cricket in Pakistan and to find a way forward. It’s not simply a debate about departments versus regions as many would have us believe but the end result is that due to the weakness of the current system, some of the deserving players simply don’t make it to the top. PakPassion.net: In your playing days, were you a fan of any particular system of domestic cricket? Mudassar Nazar: I never liked playing for departments, and I would have been much happier playing for Lahore. I certainly hated my time with United Bank but I had to play for them for a very long time. There was always pressure to play all the games for them and they could manipulate the system as they had the money to play most of their games in the southern part of Pakistan like Karachi as there were spinning tracks there and we had good spinners. To be fair, I did like playing for PIA in the early part of my career as it did have a positive impact on my development as a player. PakPassion.net: Is there too much emphasis on domestic Twenty20 tournaments in Pakistan? Mudassar Nazar: The advent of Twenty20 tournaments is having a huge and detrimental effect on the quality of our batsmen. People who aren’t close to the game, probably don’t see this as an issue but I see it day in, day out. I feel that batting techniques have gone out of the window. What some of the batsmen do not realise is that in order to have a healthy Twenty20 or One-Day career, one needs to have their technique right. Your basics need to be right, otherwise you will have a very short career. Even in the Pakistan team we see that we are very good in Twenty20s but there have been times in Tests where our team has basically fallen by the wayside in terms of our batting. A lot of that is happening due to Twenty20 cricket. I can also tell you that a lot of interest in Twenty20 cricket is commercially driven and sometimes you have no choice but to give the shorter formats more importance. For example, when I was working for the ICC Cricket Academy in Dubai, we had a huge number of players who wanted to play games. So, we used to provide them an opportunity to play the shorter format of the game so that everyone could get a game, and we also made money out of it too. Of course, this kept the game going but it also had a detrimental effect on players’ techniques. And this is also happening in Pakistan at the domestic level as we have many such leagues being organised at the association and district levels. To them, if they have organised a Twenty20 League where batsmen slog, they feel that they have done their job and achieved something. Parents of younger players are happy as they feel that the kids can end up in PSL, the Big Bash or any other Twenty20 league but in my view, such players are heading for short careers. PakPassion.net: What are your thoughts on young pace bowlers such as Naseem Shah, Arshad Iqbal, Mohammad Hasnain and Muhammad Musa Khan? Mudassar Nazar: All the names you have mentioned are fantastic and great additions to Pakistan cricket. We are very hopeful that they will all come through and have a bright future with the Pakistan team. As we have seen, Shaheen Shah Afridi has already made an impact and Musa Khan is also talked about a lot because he has gained exposure in the last two Under-19 tournaments at the international level. Unfortunately, Mohammad Hasnain got injured and had a setback, whilst Arshad Iqbal is an excellent prospect. To me, Naseem Shah is bowling quicker than all of these bowlers and he is still very young but even he had a setback due to injury, mainly because he was trying to bowl quicker than what his body was ready for. Hopefully, at the NCA we will nurse him through like we did in the case of Umar Gul and Mohammad Amir. So, in terms of fast-bowling we are covered really well as you will see in a matter of 2-3 years’ time. The pleasing thing for me is that I have seen these guys develop from the time they were 16 when they were bowling around the 125-130 KpH mark and now they are touching speeds like 140-145 KpH. So, there is a gradual but definite progress there and I am very excited about their future prospects. I feel that they all bring different skill levels and talents to the mix and I am so glad that you mentioned these names, although I do wish we had similar things to say about new batsmen too, but unfortunately we don't. PakPassion.net: Are you concerned about the careers of players like Zeeshan Malik, Hasan Mohsin, Khushdil Shah, Saif Badar who have also not been picked for the PSL? Mudassar Nazar: Saif Badar was picked by Lahore Qalandars but unfortunately, they decided to not play him for reasons best known to them. However, he is starting to make a comeback and hopefully he will come through again. The other players you mentioned are a concern to me as they haven’t made that much of an impact but I know that they are all working hard towards getting better. One thing that I realised when I was away from Pakistan cricket for 8 years was that the importance of Under-19 cricket has diminished greatly. In the past, our cricket was all about Under-19s cricket and that formed the basis for future Pakistan sides. Unfortunately, the people in charge during my time away made sure that Under-19 cricketers were left in the wilderness. The regional associations took them on, but the departments never got hold of them and they got lost in the system. In fact, I feel that there were about 20 players who got lost in this way. On top of that, we have over forty percent of players who are over 35 years of age who are still playing in first-class cricket which is preventing the younger players to come through the ranks. But all this needs to be looked at and I mince no words when I say that we do have a job at hand if we want to take this forward and secure a great future for Pakistan cricket.